It's that time again in Canada, hunting season. This year both my grandsons have sat and passed there hunter courses and can now legally purchase their own tags. 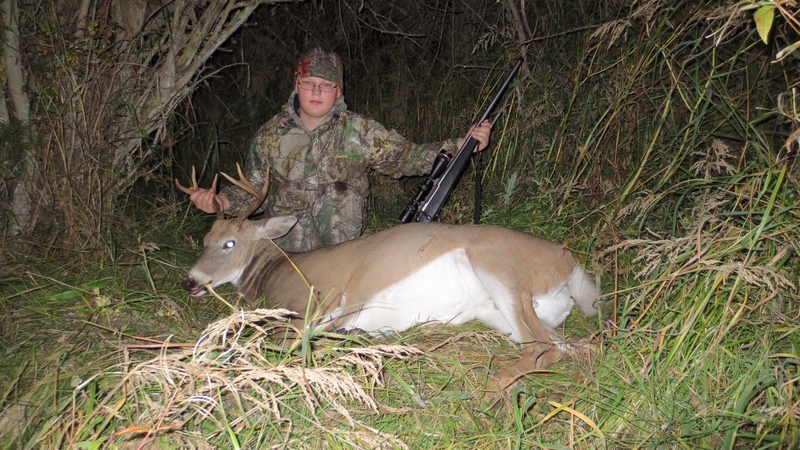 They are still to young to own a firearm but Dad Deereman, has that end covered. Both boys have tags for Whitetail, Mule Deer and Elk. A couple of days back Deereman and the boys had a good but busy day. In the morning Deereman was out with his neighbor Scott when they spotted a legal bull Elk out in the field at there feedlot. 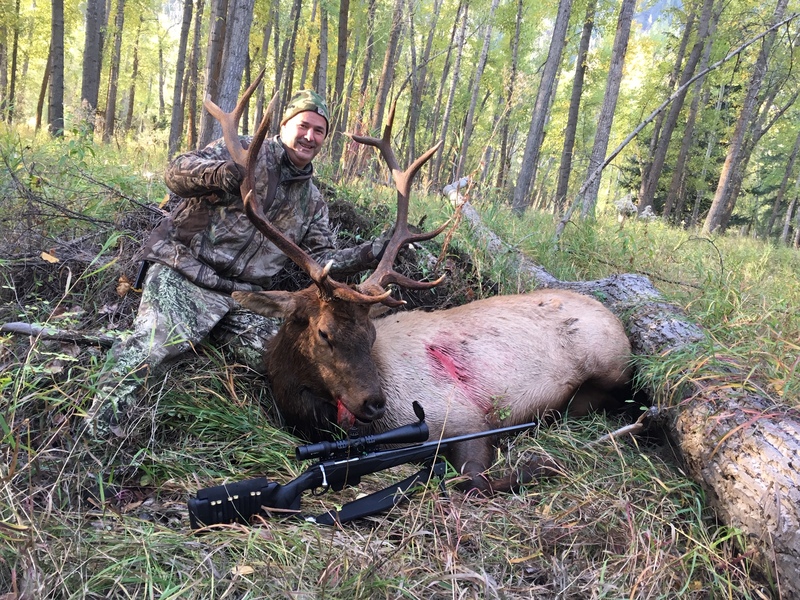 After getting into range Deereman offered Scott the shot and at 125 yards he planted a 162gr ELD X (7mm Rem Mag ) in the shoulder and surprisingly the bull took off into the willows along the river. After a short search the bull was found, the shot had been good ( see picture that is the entry hole) but it had run a wee way. When the animal was skinned out the ELD X hadn't exited and only fragments of jacket were found throughout the chest cavity. The bullet had hit a rib on the way in which wasn't a lot of resistance but it appears that the bullet at that close range was still going to fast and flew to pieces, had the range been further the bullet would have held together better and penetrated further. At the end of the day it still worked and on a big animal but on those big bulls you do need good penetration. That afternoon my son Deereman and oldest grandson Tyler were out on another hunt on part of the ranch. Close to dark they spotted a whitetail buck that Deereman had seen the afternoon before but darkness beat him then. The buck was out with a couple of his lady friends tearing around the fields, playing silly buggers, but time was marching on and a repeat of yesterday afternoon was looming. Tyler was instructed to be ready for the 250 yard shot as soon as the buck stood still long enough. Eventually with several minutes of shooting light left the buck stopped and presented a reasonable shot, boom and a solid thump came back.... bugger sounded like a gut shot. The buck stood there hunched then walked slowly into the cover by then darkness was upon them. They walked back to the truck and got there torches and then went to where the buck had left the field, after a short walk in they found the buck which still required a finisher to the neck. The shot from the 243 had hit the buck in the middle and angled forward to come to rest by the front of the shoulder just under the skin. The 90 grain Accubond had mushroomed back to the boat tail and doubled in diameter, still weighting 78 grains. Overall very good performance but once again no exit hole so there was no blood trail which can lead to lost animals if they get into the thick stuff. Tyler was pretty stoked to get his second deer and it was his first Buck so now the pressure is on to get Hunter my other grandson a deer or Elk, I know he is busting to get one. Doe season opens tomorrow so thing become easier for him as he can shoot either. Shootm, veitnamcam, tikka and 16 others like this. Awesome. Your grandson will be well stoked with that. Love seeing game from the north America . One day I will go over there. It sure is a great place to hunt and see a lot of game. Thanks for the right up MM , those whitetail always impress on how big there bodies are in comparison to ours , me & my mate have been dreaming for a while to hunt elk , moose & whitetail , one day ! It is expensive but if you can do it don't let that put you off it is worth it. Great country, people and plenty of well managed game. Is it genetics? Or do they put more weight on for colder winter? Or is it a better food source from the grain farms etc? That Elk Bull was correctly hit and should have been flattened on the spot esp. with a 7mil mag. Not a big Bull only around 320 - 350 kg liveweight by the looks. Rubbish bullet performance. I won't be trying them. I have been using these in several calibers and are more than happy with them, I do agree on bigger bodied animals up close they may be a bit fragile but so far they are working for me so I won't change yet. Pink blood, typical of a good lung shot, pretty normal for an animal to run with a lung shot until it runs out of oxygen. Bloody nice stag. Not just genetics. There is a growth response in animals to being moved further North. Greater size equals proportionately less surface area to mass. As an example a population of Roosevelt Elk was established on Afognak Island ( didn't check spelling but it's something like that) using animals from the Washington state wild population. Within a couple of generations they were exhibiting much greater body size than the parent stock. The reverse is the case if you took those Elk to the tropics. The point in the article that concerned me was that the projectile flew to pieces. It was a good well placed shot on a smallish Bull. If that was a real big chap say 480 kg he would not have been found. They say the sheep in Southland are bigger than the sheep in the North Island.